Discover the rest of these original horror stories from around the world. Each author chose a letter of the alphabet and was given complete artistic freedom to make something horrible happen. Some stories will be mysterious, others creepy or even profound, but all are crafted to thrill and terrify you to the last word. This is what happens when dozens of uncensored creative people are allowed to mine the depths of the human psyche for the most depraved, twisted, horrible things imaginable. Excerpt: "What it really meant was she was rotting away in a cage of her own flesh. The weight of her own body had crushed the flesh on her backside so that it had stopped circulating blood, had started to die. It meant that, after only twenty-six days of freedom, I had to go home and take care of her again. I came back to a familiar smell of piss and sweat and mold; but that was all mixed with a new taint, the sour and yet sickeningly-sweet smell of rotting flesh. She wasn’t in her usual chair. Instead, I found her collapsed on a mattress in a bedroom she hadn’t used for as long as I could remember, the springs creaking under her weight. She was dressed in a simple blue shirt, almost like a hospital gown, and lifting up the bottom edge, my eyes came level to where she was rotting." - "N Is for Necrosis"
About Haunted House Publishing: We're passionate about publishing horror stories for adults, scary books for teens, and all sorts of dark fiction. Full list of authors: Tobias Wade, David Maloney, Mr. Michael Squid, Ryan Cook, DoverHawk, Kyle Alexander, Grant Butler, Jack T. Anderson, M Higgins, Bak Hayong, Chris Thompson, Jacob Mandeville, J. Y., Marni Sue, Kaitlynn Cooney, Kelly Childress, Mikey Knutson, Noah Rex, John Buffalo, Harrison Prince, P. F. McGrail, H.G. Gravy. First of all: "This book was given to me for free at my request and I provided this voluntary review." With that out of the way, let's talk about this book. The short stories in this book are all connected in a couple of ways. First of all, they are presented sequentially, with the title of each story starting with the next letter in the alphabet, A is for Addiction, B is for Barnacle, etc. They are also connected thematically, with many recurring elements throughout the stories, such as barnacles, doomsday cults, etc. I really liked the cohesiveness this lent to the work as a whole. While the writing style overall was excellent, I found that some of the stories just didn't hold my interest. 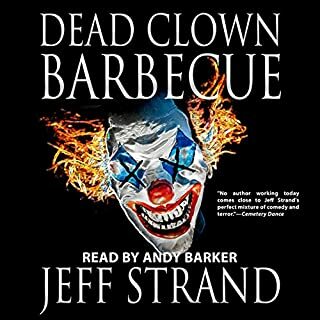 The narrator of this audiobook has a terrific voice for the genre of horror. His accent added an element of mystery to everything, and his voice was overall very pleasing. The emotional rawness of the tales was expressed nicely in his vocal tones, and he really helped to draw me in to those stories that grabbed me the most. Overall, a nice collection. It was hit and miss with the stories. Some were genuinely creepy. Some were not as good. Awesome collection of horror shorts! Very interesting concept! I really enjoyed the stories, and the narration was amazing! All connected somehow, but each stands on its own. Really enjoyed listening, and hope to hear more in the future. If you're into horror stories, and you know you are, check this out! This is an engaging collection of stories that will give you chills and make you think twice about many everyday things and happenings. Each story is connected to the others in its own way and we soon see so many evils in the world. Each letter gives you a different subject, yet they all intertwine and work well together. I enjoyed all the different subjects in these stories and how they connected. The stories are well written and give the listener much to think about. Narrator Paul Jenkins does a good job of bringing these stories to life and keeping the listener interested and engaged. In this collection there are twenty-six stories total. Some are good and some just miss the mark. The really cool part of this collection is the story arc. You'll notice how most of the stories are connected to another within the collection. It's really cool trying to make the connections, especially after listening to half of the stories. This is definitely a collection of horror, macabre, and downright weird but enjoyable nonetheless. The narration was well done and only added to the experience. If you are a horror fan then this collection is something you really need to pick up. Tobias Wade collects 26 somewhat intertwined horror stories, each based off their respective letters (M-Mirror, L-Lunar, etc). Some are creepier than others, but my favorite is probably C - Clairvoyance; which has a "seer" as our hero of the chapter. It is also the one that interacts the most with other chapters. Paul Jenkins does a good job with voices, despite dealing with a roster of, I dunno, 50+ characters, none of which actually crossover between stories. 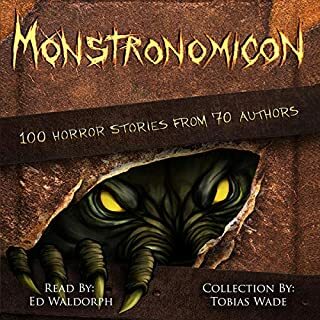 A mostly excellent anthology of horror short stories with a wide array of topics and styles. Great entertainment with only a couple of clunkers. Overlook the cheesy cover art and buy this audiobook! Unbiased review written in exchange for a free copy. This is a great collection of short horror stories. They are all different (which makes sense, since they're all written by different people) and well written. The narration is good too. 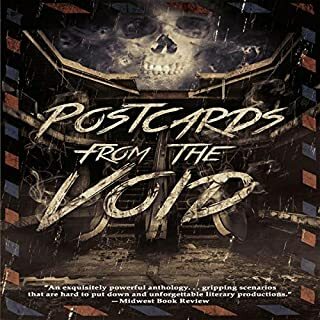 All in all, if you like horror stories, and short story anthologies, you will probably like this one. As other reviewers have indicated, this is a compilation of short stories and (like most short story collections) some are more engaging than others. Also, there is an over-arching narrative that connects stories together. Like others here, I started to realize within the first three or four stories that stories were linked. For better or worse, that focused my mind on trying to understand these connections and figure out what it was all about. I say 'for better or worse'. For 'better', because I really like the idea of connected horror stories - it's an interesting way to present a short story collection. For 'worse', because (as other reviewers have noted) things start to get really weird towards the end of the book. The more information that was revealed to me, the more confused I became. I think this is because there were more than two dozen stories to try and connect, and sometimes the connections were very fleeting indeed - in some instances, a mere handful of words in a sentence tugged you back to a previous story. Again, that's very cool! But... um, it might have been easier on my poor brain if the author had used a theme of seven days in a week, or 12 months in a year (fewer stories to connect!). This is definitely a short story collection that I'll want to listen to again, this time with a pen and paper to take notes. It's definitely possible that if I re-listen to the audiobook, things will become more cohesive and clear. The narration was well done and reflected the rising and falling tension in many of the stories. A minor disconnect for me was that the narrator spoke with a UK accent but the stories were set in the US. There's nothing specifically wrong with that. But, to use a flipped example, if I listen to an audiobook about British history, my preference is that the narrator have a British accent, to make it easier for me to become immersed in the context of the book. So as perverse as it may seem, if this collection of short stories were set in the UK, I'd probably have given the narration 5 stars. Since the stories were clearly set in the US, the British accent of the narrator distracted a small part of my brain that was wanting to hear a more authentic-sounding accent for the region where the stories were occurring. Very good collection of very short stories. Each one beginning with a latter of the alphabet. The stories are compiled from various authors, some better than others just like the stories, but overall the quality was very good. I felt that the quality started out strongly but faded a little right near the end. The narrator Paul Jenkins I have heard before and he did a good job telling the tales overall. This book is made up of chapters A to Z, each with a story surrounding something beginning with each letter. Each chapter around 10 to 20 minutes long. Some of these reminded me of black mirror such as A for addiction. Some of these stories were boring, but most of them were good - I do recommend this book to anyone looking for some bedtime stories, as they are short enough to listen to each story in one session just before you sleep!